at the base of the center support pier at Lock E-13,the requires immediate attention to ensure the movable dam built in 1917 remains standing. 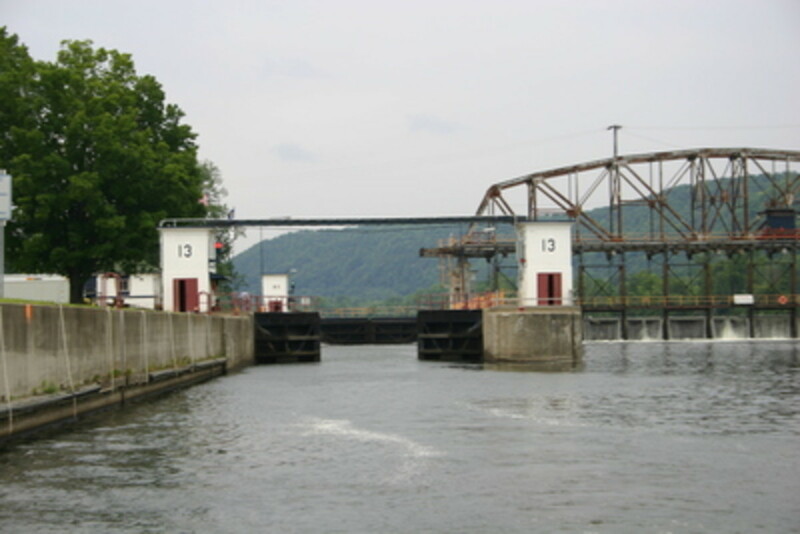 Three piers, the southern of which is currently being replaced by construction crews, support lock E-13. Crews noticed water entering the workspace and attempted to fill the spot in over the weekend. 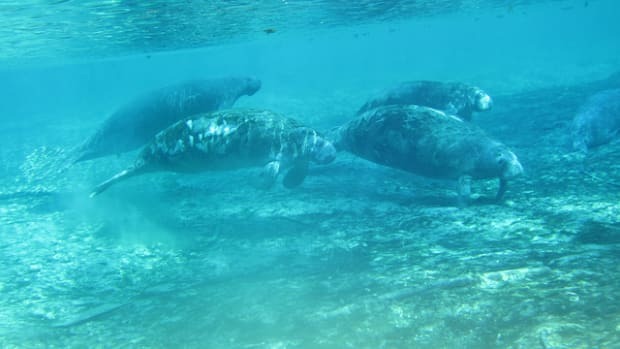 The failed patch effort led to an underwater inspection on the neighboring two piers where divers located the hole, created by fast moving water, under the center pier. 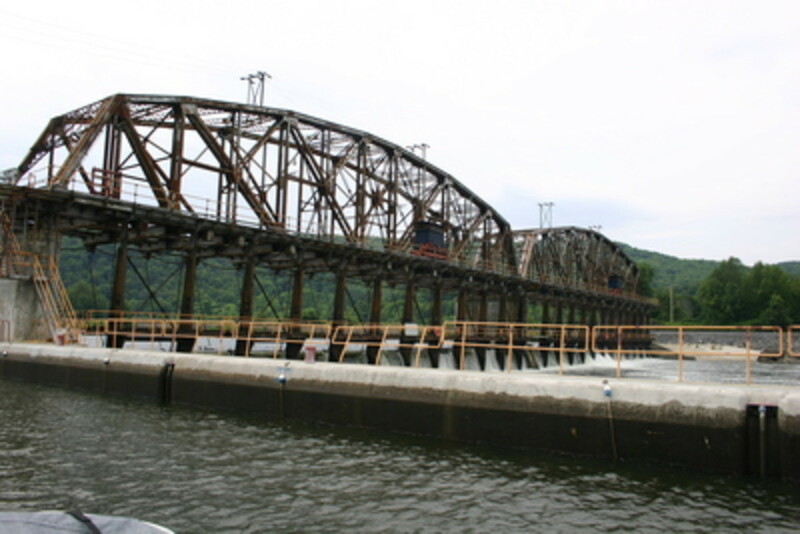 All water has been released from behind the dams spanning from Lock E-12, in Tribes Hill, to Lock E-14, in Canajoharie, to allow workers to fill the large opeing with a mixture of grout and concrete. Authorities report the work, which leaves the canal impassable from either direction, could take three weeks, maybe more. The dam at Lock E-13 is considered an “immediate hazard dam” and is inspected as often as every two years. Most immediate hazard area dams were inspected thoroughly following tropical storms Irene and Lee. Crews are working quickly to reopen the canal and Canal Corp Director, Brian Stratton, has asked for the patience of transients during the emergency repairs. 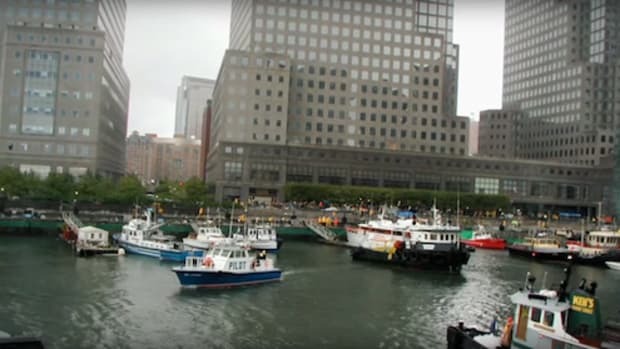 “This work is being done for the safety of both the boating public and Canal Corporation employees,” Stratton said in a statement. “We are focusing all available resources on completing these necessary repairs and reopening the canal as soon as possible. 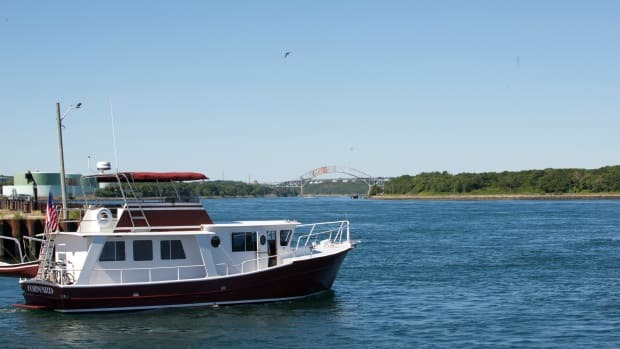 Either way the Erie Canal closures are sure to cause headaches for commercial and pleasure cruisers alike. 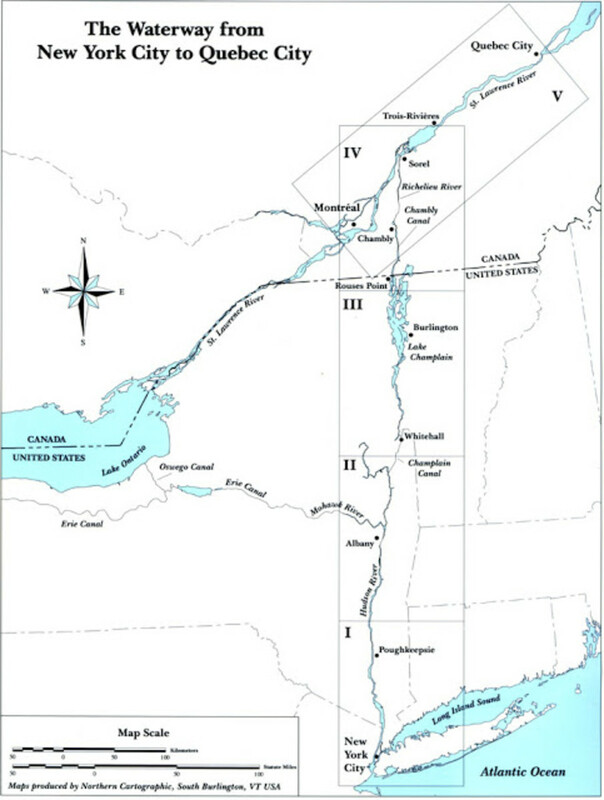 A map illustrating the Erie Canal in comparison to the route cruisers will have to take up to Sorel. 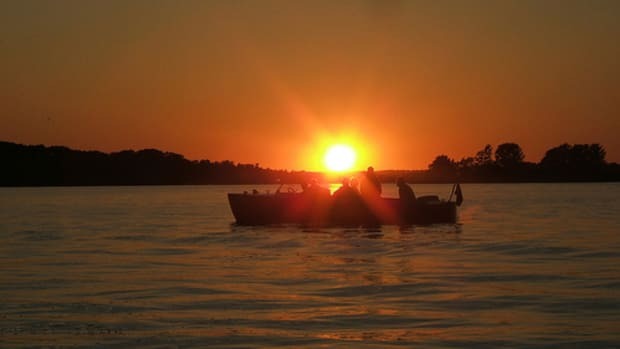 According to boating blogger Wally Moran, there are several ways to bypass the problem area, though none are particularly convenient. 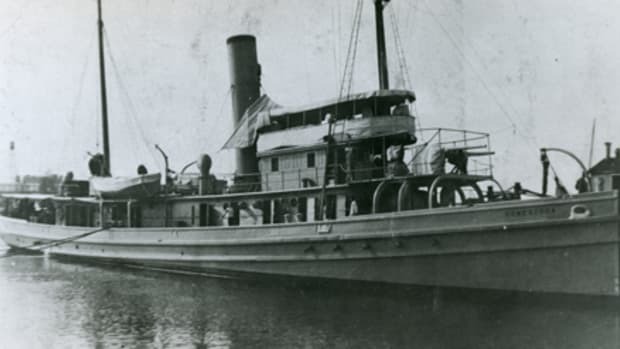 “Boaters in Lake Erie can transit the Welland Canal in to Lake Ontario, then proceed east to Sorel, Canada, which is 39 miles east of Montreal,” reported Mcgillivray on his blog. From Sorel, Canada, boaters follow the St. Lawrence River for about 68nm to the U.S. boarder at the northern end of Lake Champlain at Rouses Point, NY. An additional 60nm lands cruisers at the federal lock in Albany, NY. 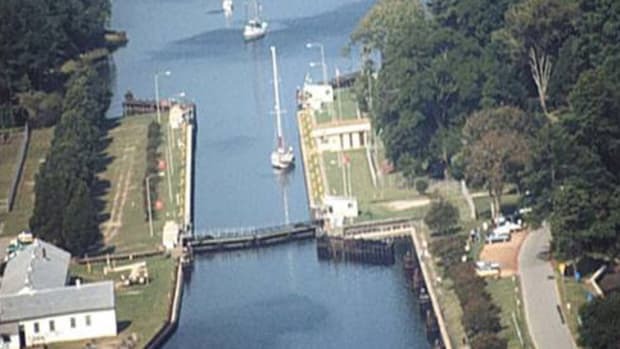 “Alternatively boaters can enter the canal and proceed at a reduced pace to bring them to the lock by its reopening,” McGillivray writes. 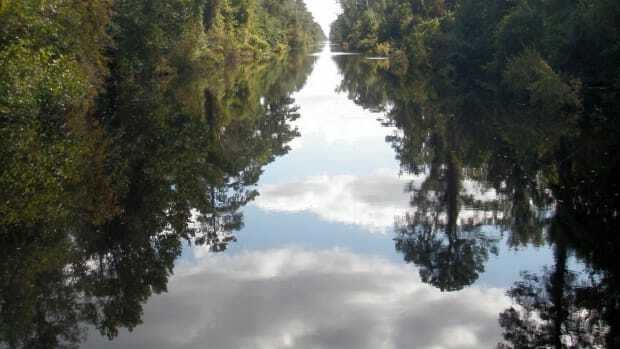 To help ease the strangle hold the closure places on transients, this potion of the canal will be reopened for a limited time from Friday, October 4 through Sunday, October 6. Opening times are during normal operating hours, from 7 AM to 8PM daily. 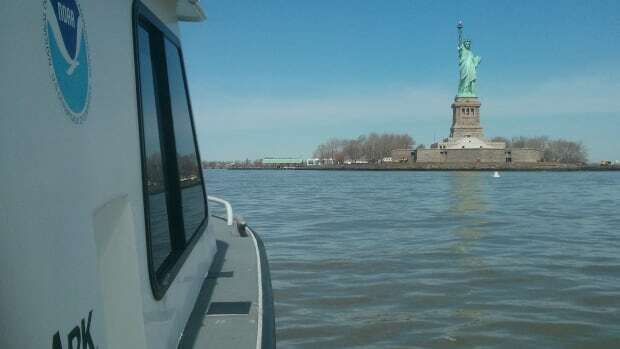 Mariners are warned that the navigation pool will be reduced during this opening to only 8 feet between lock E-13 and E-14. The locks will reclose after closing time at 8 PM Sunday. 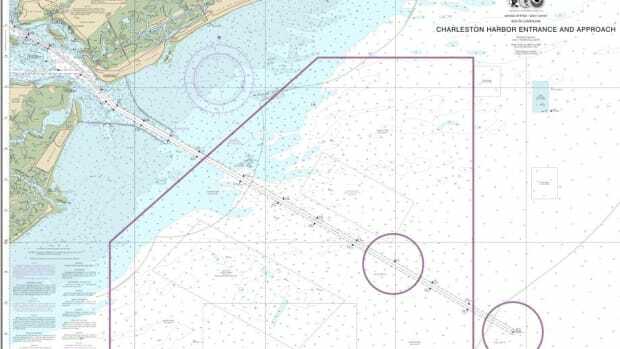 “The Governor has set a high priority in completing the repairs as soon as possible, as there is commercial traffic that must move [through the canal],” McGillivray writes. Tioga Construction crews have been tending to the canal since 2010 as part of a $15.5 million rehabilitation project. The damage to Lock E-13 is only the most recent snag, and crews will continue work once the lock reopens.